LOT Publications Webshop. How Friendly are the Natives? How Friendly are the Natives? This study is the first ever to employ a large-scale Internet survey to investigate priorities in English pronunciation training. Well over 500 native speakers from throughout the English-speaking world, including North America, the British Isles, Australia and New Zealand, were asked to detect and evaluate Dutch pronunciation errors in sentences read by bilingual actors. Through the application of up-to-date statistical procedures, these assessments were analysed and then used to construct hierarchies of error for pronunciation training in the most commonly taught varieties of British and American English. The attitudes of the various groups of native speakers towards error detection and evaluation were found to be strikingly different. Nevertheless, the findings indicate that almost all natives attach considerable significance to pronunciation errors that impede intelligibility. In those cases where there is no loss of intelligibility, they often respond negatively to features that are socially marked in native varieties of English. This effect of stigmatisation was found to differ considerably, for example, between countries such as the United States and Britain. 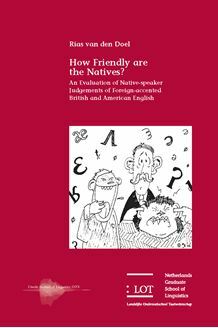 Even non-native pronunciation errors that are very similar to features actually attested in respondents' own accents are not necessarily judged more leniently. In addition to discussing the effects of linguistic background on the judgements of native speakers, this study also considers the error assessments of Dutch teachers and students of English, and provides a brief overview of pronunciation training in the Netherlands. This research will be of interest not only to phoneticians and sociolinguists with an interest in second language acquisition, but also to teachers and students of English pronunciation and accent varieties.